This is the state-of-the-art Maha MH-C204F "smart" charger, it can rapid charge (60-160 minutes) your NiMH and NiCD AA / AAA batteries with the precision that only microprocessor technology can provide. Designed with two independent circuits. You can charge one or two sets of two batteries totally independent of each other. Most of us will be using the Maha C204F with NiMH type batteries and this charger will rapid charge them using a 500mA charge current. You can safely use this charger to "freshen up" a set of batteries as the onboard microprocessor will automatically switch from rapid charge to trickle (24mA) as soon as it senses that the cells have been fully recharged. The charge time varies from 60-160 minutes due to the difference in the capacity of the cell (900-1500mAh) and the state of discharge. When using NiCD (Nicad) type rechargeable batteries they often exhibit "memory" problems. This is when the cell has been charged before complete discharge or left on trickle charge for long periods of time. It has often been debated by battery "experts" that there is no such thing as the dreaded memory effect but those of us that use them know this IS a reality. The MH-C204F can condition NiCD cells by thoroughly discharging them at 240mA and then automatically rapid charging them. To condition your batteries you just push the pushbutton on the front and the LEDs will then turn yellow and blink. A current sensing IC switches the C204F to normal charge cycle after conditioning is complete. Operation of the charger is very easy. Simply put two or four AA or AAA cells in the charger, plug in the AC adapter and then plug the cord into the charger. The C204F automatically goes into rapid charge mode and the LED indicators turn red until the rapid charge cycle is completed. When finished the LEDs turn green to indicate that the charger is now in trickle mode. You can use the Maha C204F either at home with the included AC adapter or in your car or boat or anyplace that has a 12V cigarette lighter plug with the optional 12V power cord. Thomas Distributing now has a European power transformer for the C-204F and C-124S chargers. 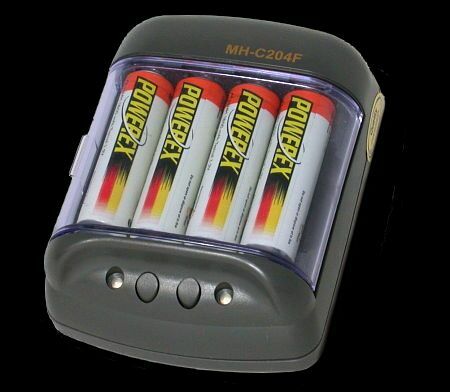 Check out the Maha 1800mAh NiMH AA batteries, very high capacity. We all hate to waste time and that's one thing this charger definitely doesn't do. It will charge up a set of NiMH or NiCd type batteries as fast as possible via "state of the art" microprocessor technology. It's small (barely larger than the four batteries it holds), smart and relatively inexpensive at $24.90. The only technical challenge for the user is inserting the batteries the right way. With the option of AC power or 12VDC it is highly portable so take it with you! Going out of the country, then check out the foreign voltage adapters (Euro 220V, UK 220V, Australian 220V) that Thomas Distributors has available. This battery charger is a real winner! Content copyright © 1998-2002 Steve's Digicam Online, Inc.